Gladstone was born on 20th December 1809 at 62 Rodney Street, Liverpool to John Gladstone and Anna MacKenzie Gladstone (nee Robertson). He was first educated at Eton where he maintained a close-knit group of friends including Arthur Henry Hallam, the inspiration for Alfred Tennyson’s A. H. H. In Memoriam. From there he went on to achieve a double First at Oxford in Classics and Mathematics, a sign of the greatness he would later go on to achieve. W. E. Gladstone’s political career was vast and varied, with him taking the position of Prime Minister four times between the years of 1868 and 1894. The ‘Grand Old Man’s’ social responsibility also existed on a personal level, as demonstrated by the foundation of his library. He intended for this library to provide knowledge and education to all, which is perfectly demonstrated by his original name for the library, Monad, meaning 'truth'. It was through his wife, Catherine Glynne, that Gladstone came to reside in Hawarden and eventually open his library here. Catherine’s family owned the historic Hawarden Castle, situated just across from where Gladstone’s Library now stands, nestled in the grounds that Gladstone once walked in and that you yourself can stroll in today. There they and their children stayed when they were away from London, with Gladstone working in his own private study, the Temple of Peace (pictured above). 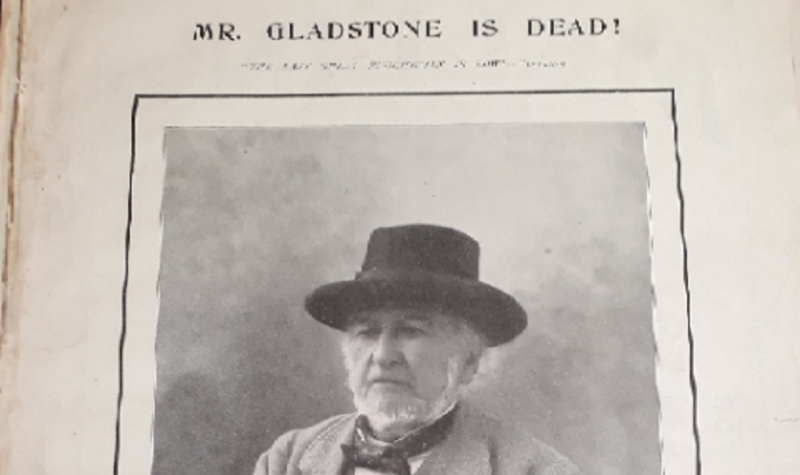 As he reached old age Gladstone showed no signs of slowing down in his active life. He still enjoyed chopping down trees on the Hawarden Estate, and you can see one of his axes in the display cabinet in our History Room today. He was also incredibly close to his family, including his granddaughter Dorothy Drew whom he called ‘Dossie’ (pictured above with Catherine Glynne-Gladstone). It is rumoured that Gladstone himself aided in the transportation of 32,000 books from his personal collection to the new library, using only a wheelbarrow, his daughter and a servant for help. William Ewart Gladstone passed away on 19th May 1898 at his home, and was survived by his wife and six children. He was buried in his university robes and mortarboard, and a photo of him lying in state can be viewed here [GG/1983]. Gladstone was interred in Westminster Abbey, London and there is a memorial to him and his wife Catherine in St. Deniol’s Church across the road from the Library. We hope that this post has done justice to the name and achievements of William Ewart Gladstone. He will always be missed but fondly remembered, especially when one is reading a book from his personal collection by the light of the sun coming in through the window of the place he dreamt of but never got to see.